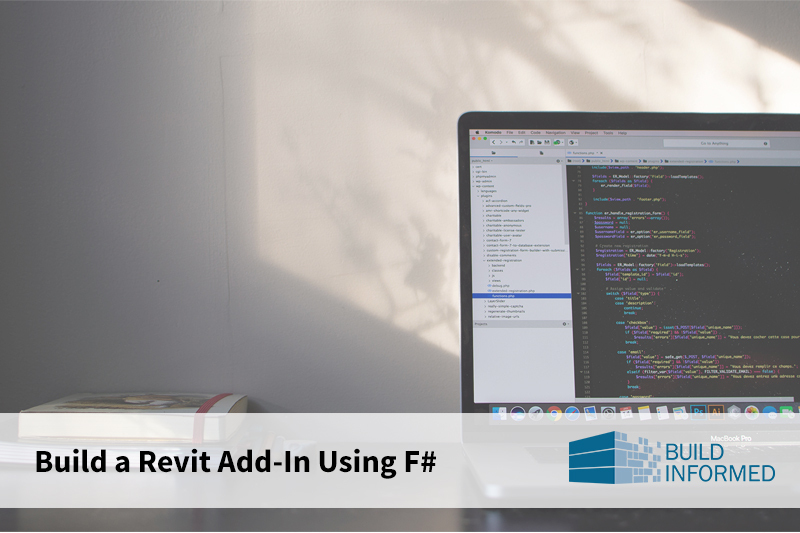 This guide is meant to help developers get familiar with the structure of a basic Revit add-in. The code specific to this particular add-in is not covered in detail. This is what I learned building my first Plugin for Autodesk Revit. By default door tags in Revit contain an auto-incrementing number starting at 1. Often it would be more useful if they showed the number of the associated room instead. This is also the naming scheme followed by the Revit Architecture sample Project. The Tool – Why F#? Type inference is awesome. The F# compiler is smart. Usually it deduces most variable types and function signatures without requiring you to explicitly declare them. Clean syntax is cool. In F# you don’t need curly braces or semicolons for delimiting code blocks. Like in python, this happens through indentation only. This eliminates much of the noise that takes up many lines of code in a C# program. List functions and lambdas rule. As you will see later, F# makes it easy to perform complex operations on lists and sequences. For more information on why F# is awesome I recommend reading Scott Wlaschin’s “Why Use F#?” Series. A Revit add-in can either be a Command or an Application. Commands (Revit.DB.IExternalCommand) execute once when triggered. Applications (Revit.DB.IExternalApplication) start on Revit startup and run until Revit is closed. All the important meta-information is saved in xml files with the .addin extension. These files are called add-in Manifests and contain the path to the add-in dll and information like the author’s name or a unique GUID. One add-in Manifest file can contain information about multiple add-ins. On startup Revit (2017) checks the addin folders ProgramData\Autodesk\Revit\Addins\2017 and Users\[user]\AppData\Roaming\Autodesk\Revit\Addins\2017 for add-in manifests. It then tries to load the described add-in executables. An application that waits until a new doors is added and then changes its tag. When using Visual Studio, we need to add references to RevitAPI.dll and RevitAPIUI.dll, both located in C:\Program Files\Autodesk\Revit 2017\. We then start by building a simple class that implements the IExternalCommand Interface. … we already have a valid Revit command! Because the FilteredElementCollector implements IEnumerable (and we already filtered for FamilyInstances) we can cast the collector into an F# Sequence of FamilyInstances. Thanks to F#’s smart type inference we don’t have to declare any type explicitly. The compiler knows that the FilteredElementCollector constructor needs a Document and deduces that the argument of getDoors has to be a Document. Now all that’s left to do is change each door’s mark property to the number of the door’s containing room. A post about handling Events in Revit that follows up on this example will be available soon. It will released on our Blog and on our Social Media Channels.